Inspired by the forms and functions of protein molecule machines and materials observed in nature, such as the shells that protect virus genomes, researchers have now engineered ten large, 120-subunit, two-component protein complexes. These structures not only build themselves with atomic-level accuracy, but also can encapsulate other materials. The materials were designed to possess icosahedral symmetry, which affords efficient construction by repeating geometric arrangements, while maximizing packing room for carrying a payload. An icosahedron is a 20-sided polygon, and is the basic modeling unit for geodesic domes. The same edition of Science also contains a profile by Robert Service, "Rules of the Game," of computer-designed protein molecules pioneer Dr. David Baker, UW professor of biochemistry and a Howard Hughes Medical Institute investigator. The lead researcher on the 11-member team was Jacob B. Bale, a recent graduate from the University of Washington’s Molecular and Cellular Biology Ph.D. program. He is now a research scientist at the Arzeda Corporation in Seattle. investigator, and King is a translational investigator and acting assistant professor. The work was carried out in close collaboration with researchers at the University of California in Los Angeles and the Howard Hughes Medical Institute’s Janelia Research Campus. “We set out to design two-component icosahedral protein structures capable of packaging macromolecular cargo through controlled, in vitro [test-tube] assembly,” the researchers wrote about their effort to create new nanomachines for practical applications. The protein structures were envisioned at the atomic level via molecular modeling software developed at the University of Washington and a growing number of other institutions around the world. The proteins comprising the nanostructures were encoded in DNA sequences and produced inside of bacterial cells co-opted to serve as small protein manufacturing factories. The proteins were then purified and characterized by a variety of techniques. Ten of the materials were found to match closely with the design models. The protein nanostructures reported in this study are the largest designed protein complexes to date confirmed by X-ray crystallography. With molecular weights between 1.8 to 2.8 megadaltons and diameters of 24 to 40 nanometers, the designs are comparable in size to the protein shells that contain the genetic material of a small virus. CLICK FOR FULL IMAGE: Computational models of the ten successful designs are shown via molecular surface representations. Each design comprises a pairwise combination of pentameric (grey), trimeric (blue), or dimeric (orange) building blocks. The inner cavities within these newly designed molecules, along with the various ways to mix the molecule’s components, make them well-suited to encapsulate a broad range of materials. As an initial demonstration of cargo packaging capability, the researchers were able to get their protein nanocages to encapsulate a payload of supercharged green fluorescent protein. This compound fluoresces brightly in certain northern Pacific jellyfish. The fluorescent protein is often employed in labs to study the inner workings of cells and in many other aspects of biology research and bioengineering. The atomic-level precision and the rapid, controllable assembly of the designed materials, their size and complexity, and their ability to be genetically modified with additional functionalities are “pushing the boundaries of biomolecular engineering into new territory,” the researchers said. The ability to accurately design such large and complex protein structures unlocks the door to creating a new generation of biomolecular machines and materials. By attaching targeting agents and engineering payload release mechanisms, such designs could serve as the starting points for molecular vehicles that deliver drugs or genetic therapies to cells. Also, stringing virus components on the structures could enable them to serve as safe, new vaccines. And incorporating enzymes into the designed materials could convert them into miniature chemical reactors for bioenergy or other metabolic engineering applications. The work was supported by the Howard Hughes Medical Institute and its Janelia Research Campus visitor program, by the Bill and Melinda Gates Foundation, Takeda Pharmaceutical Company, the National Science Foundation, the Air Force Office of Scientific Research, and the Defense Advanced Research Projects Agency. Patents for the molecules have been filed. The researchers worked with X-ray beamline teams to verify the structure of the designed molecules at the Northeastern Collaborative Access Team beamlines, the Advanced Proton Source, and the Advanced Light Source SIBYLS beamline at the Lawrence Berkeley National Laboratory. This study builds on previous work from the authors reported in June of this year in Nature. They successfully designed a single, highly stable, 60-subunit self-assembling icosahedral nanocage. In that study they demonstrated its potential utility for a range of applications, including as a tool for light microscopy when genetically fused to green fluorescent protein. 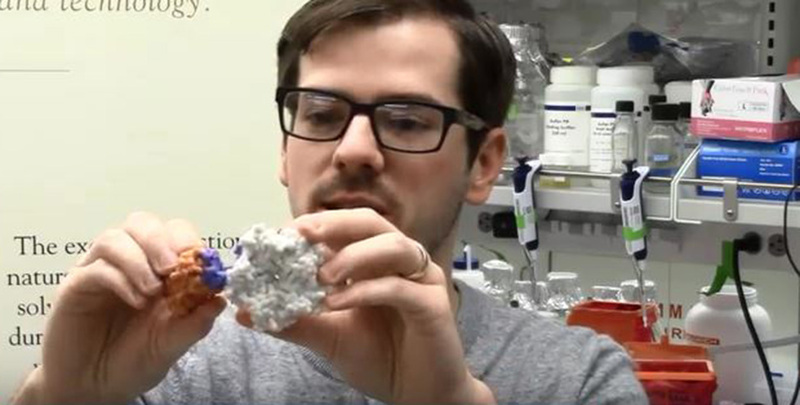 See the HS NewsBeat article, "Self-assembling icosahedral protein shell designed."